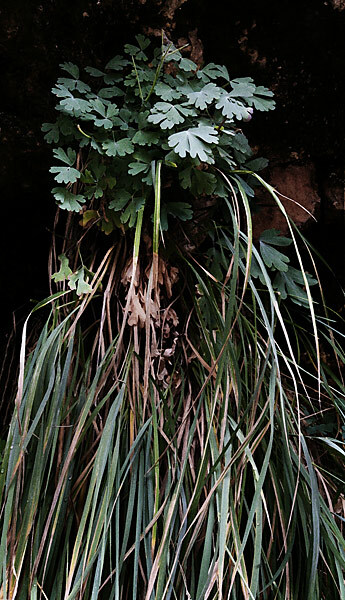 These combined plants were growing in a damp crevice in the sandstone cliffs at the entrance to the Narrow Trail in Zion Canyon, Utah. Working on the previous image, I speculated on a version in black and white. It was rather dull but a second and altered crop with sepia toning seemed a better outcome. This is a late photograph for a 'Secret Gardens' assignment followed with members of the Network of Artists in Northumberland some years ago. 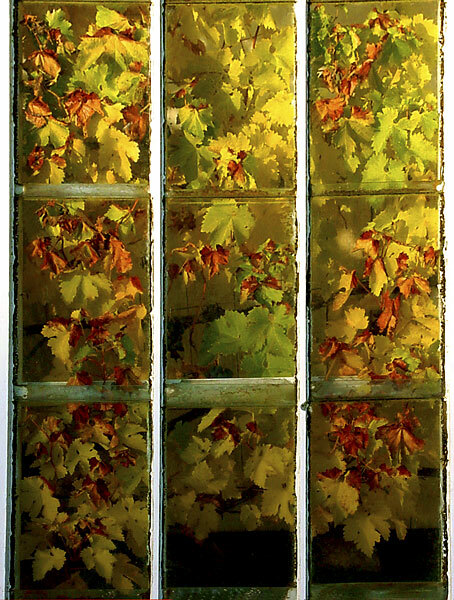 The autumnal vine leaves in the glasshouse at Chesters Walled Garden in Northumberland seem to press against the glazing to catch the last rays of the setting sun. 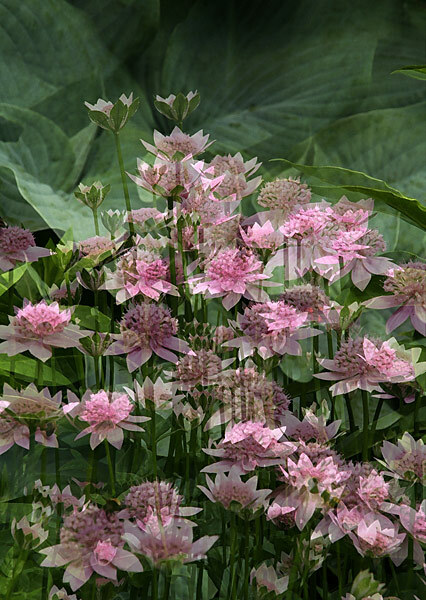 This twin image of astrantia and hosta echoes the film camera technique of a double exposure made on the same frame. As with other images, I am interested in working with shape, pattern and colour to go beyond a simple record. 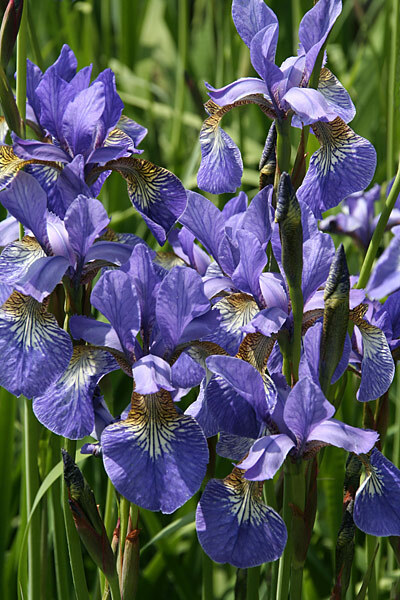 The plant's name derives from the Greek original describing the rainbow of colours across the some 300 species. 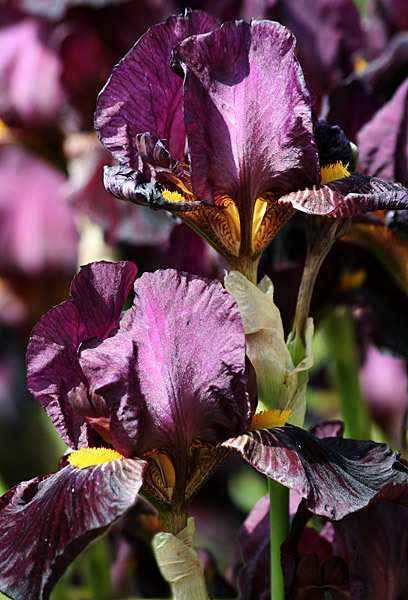 Iris flowers are varied in form and can be quite complex, supporting exotic colours and detailed marking. Unfortunately some seem to have such a short life and can be averse to spring rain. Margaret Waterfield (1860-1950) captures such a mix of colour and delicacy in her 'Red and White Irises', a broadly brushed watercolour study of a border packed with these and other colours. Wild tulips are native particularly to mountain lands from Iran through to China and Japan where the plant is well adapted to the rugged terrain and cold winters. Cultivation in Turkey is recorded early in the eleventh century, with the first specimen arriving in England in 1578 and in Holland in 1593. There, trade was intense and speculative, leading to incredible prices and an eventual slump. 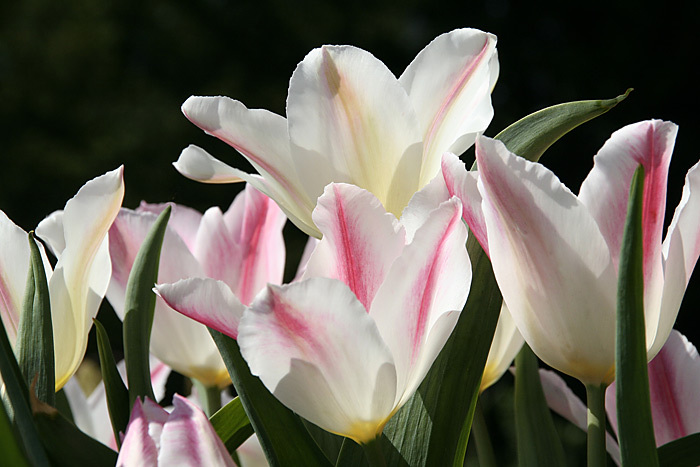 Some suggest that the name 'tulip' is derived from 'tulbend', the Turkish word for the turban, the early flower forms suggesting an inverted turban. Late nineteenth century searches lead to new finds in the wild, these aiding the further development of new forms and colours. 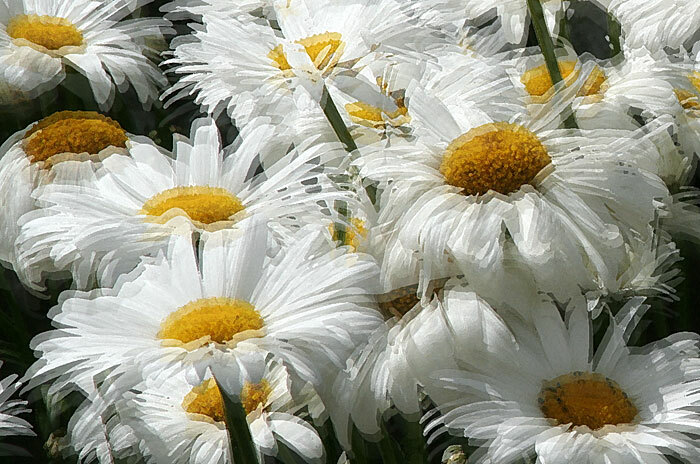 After the Orchid, the Daisy has the largest species number of any flowering plant. 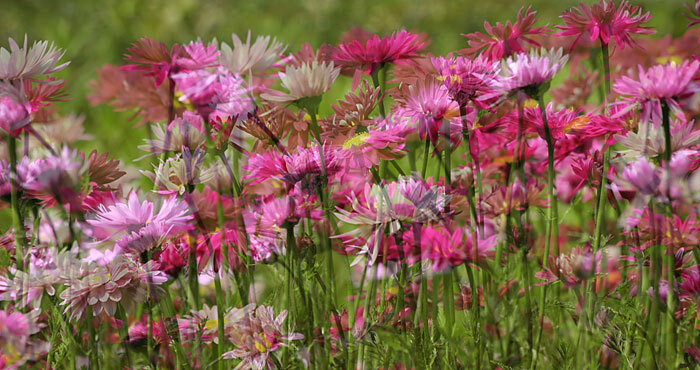 In this image I combined three exposures from a large spread of flower heads in a garden border. The Buddleia is native to the warmer regions of the Americas, Africa and Asia. Its tubular flower panicles carry tightly packed individual florets and can reach eighteen inches in length. 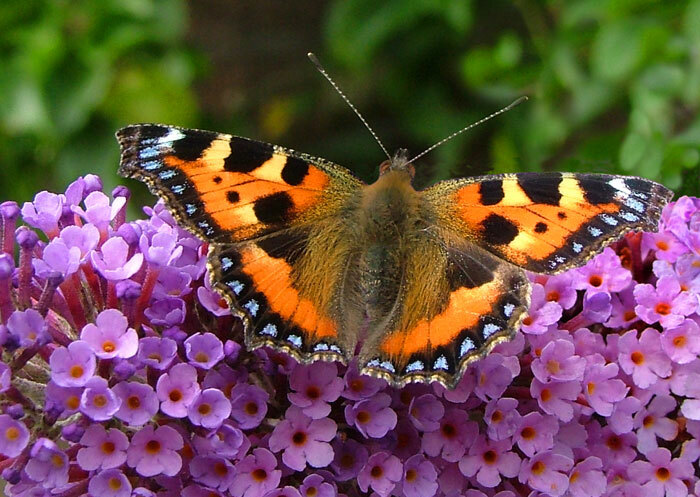 Here, one of its most ardent visitors illustrates why Buddleia is also known as the Butterfly Bush. 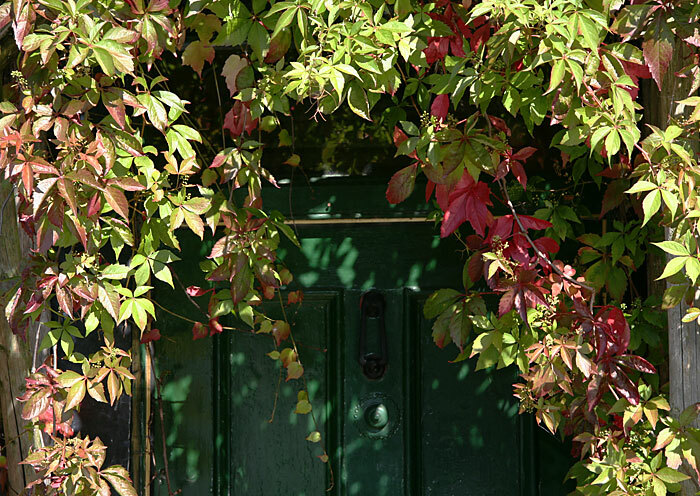 Rampant Virginia Creeper covers the three-floor façade of an unoccupied hotel in Allendale, Northumberland. The building has been renovated and the creeper is no longer allowed to grow in such wild abandon. Bright summer sun filters through the leaf canopy over a footpath near Grasmere village in the English Lake District. A clump of herbaceous daisies had spread from a garden on to a roadside verge, its large flower heads moving in the afternoon breeze and the slipstream of passing vehicles. A double exposure print seemed appropriate. 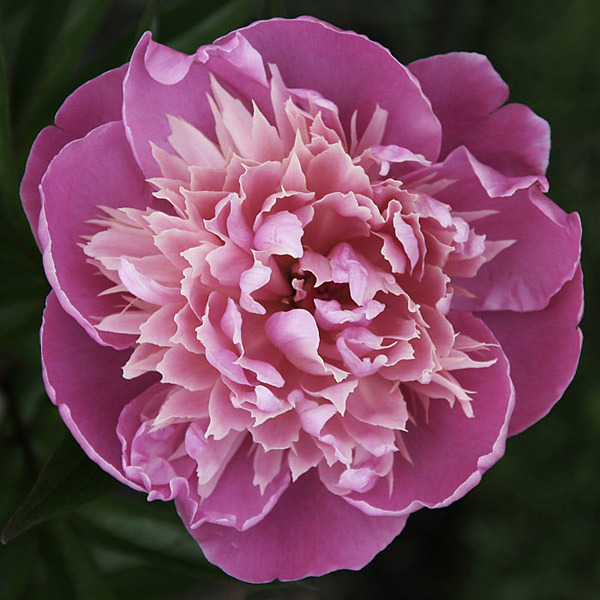 Peonies are native to Southern Europe, Asia and Western North America in shrub and tree forms. Its primary use in China from some 3,000 years ago was medicinal before gaining high favour as an ornamental plant during the Sui and T'ang Dynasties (605-906). 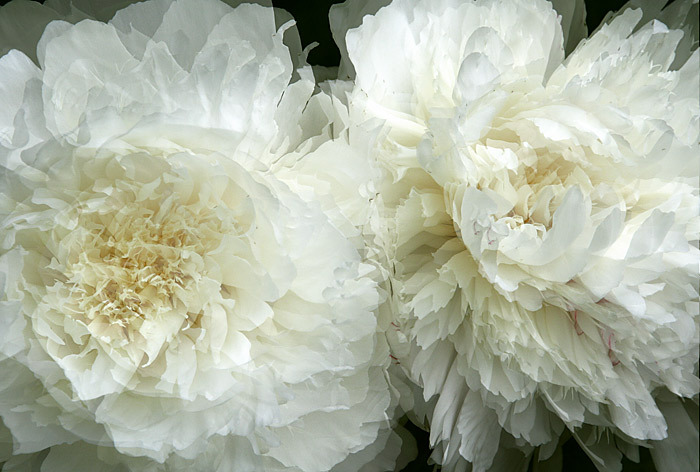 The peony has also been a motif in the art of China, Korea and Japan, particularly in ceramics. 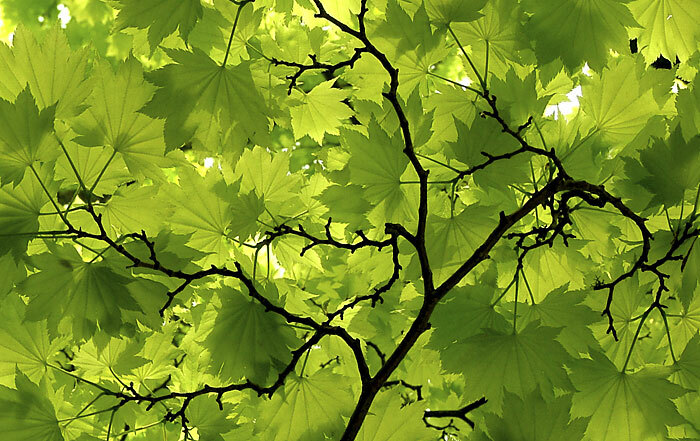 In China it symbolises love and feminine beauty and, in its tree form, Spring; its name translates as 'Most Beautiful'. In its cultivated form there are now some 1,000 varieties carrying simple or complex blooms in white, red, yellow and a wide range of pinks. 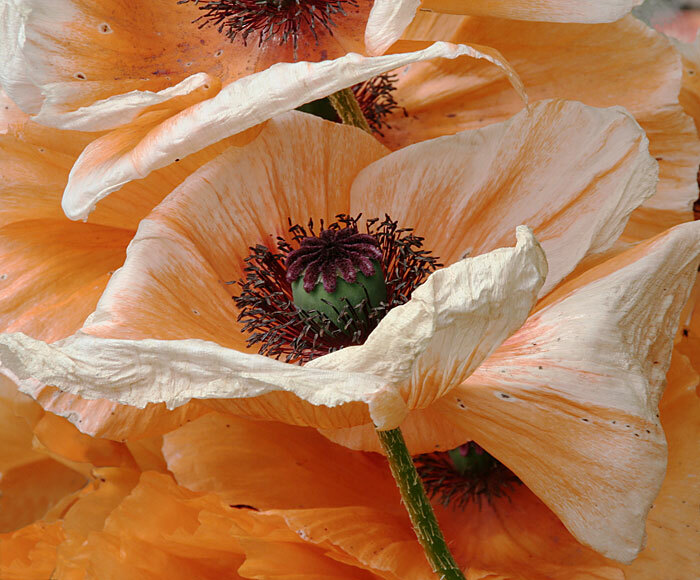 I liked the way in which the full and vibrant orange-red of this herbaceous perennial poppy was bleaching away. I have made drawings of dead flowers but this is the first photograph made to record the early stages of decline and decay. 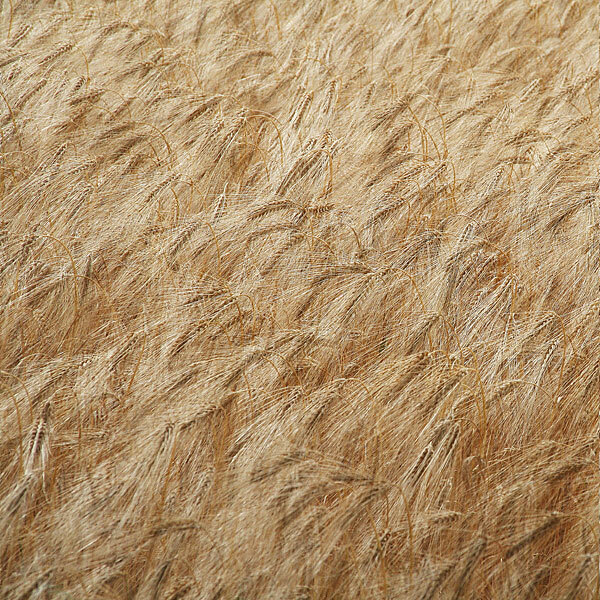 Barley heads quietly exhale as air drifts under summer sun. 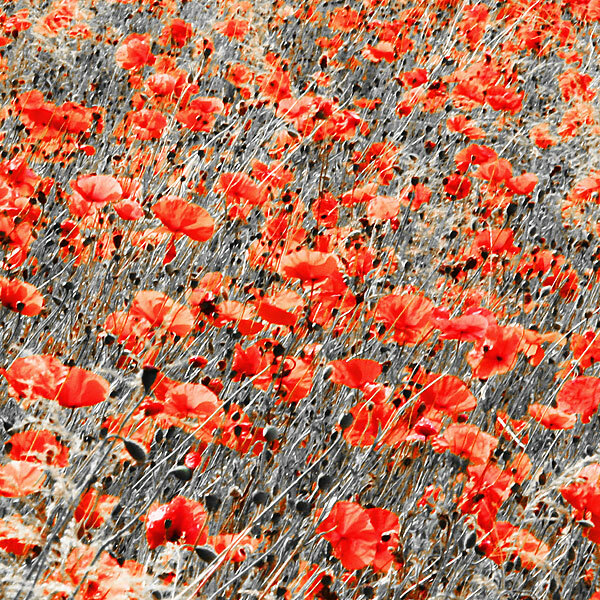 Red field poppies against the dark green of growing wheat or the gold of ripe barley are a summer event in the Tyne Valley where I live. A couple of years ago I took a lot of photographs that remain on file, largely untouched. 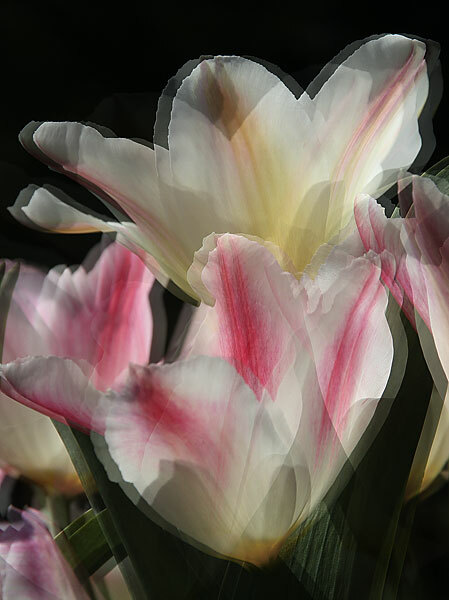 This is one of a series of exploratory images seeking a new interpretation of a familiar composition.